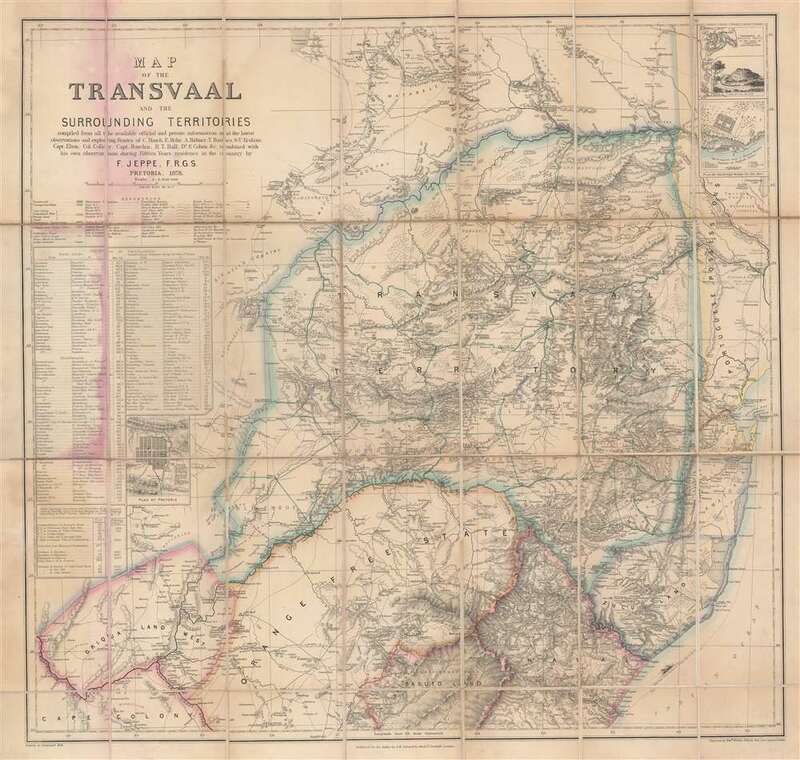 Map of the Transvaal and the Surrounding Territories. This map was made two years before the First Boer War or the First Anglo-Boer War. The Transvaal and the Orange Free State were recognized as independent states by the British since 1852 and 1854 respectively. The region became the center of attention in 1867 with the discovery of diamonds near the Vaal River, which would lead the British to annex West Griqualand despite Boer protests. In 1877, despite a treaty granting its independence, the British annexed the Transvaal, which led to the First Boer War fought between the British Empire and the independent Boer republics of the Orange Free State and the Transvaal Republic. The war would end with the Pretoria Convention where the Transvaal Republic and the Orange Free State would regain independence. This map was compiled from all the available official and private information and the latest observations and exploring Routes of C. Mauch, E. Mohr, A. Hubner, T. Baines, S. V. Erskine, Capt. Elton, Col. Colley, Capt. Bawden, R. T. Hall, Dr. E. Cohen, and combined with his own observations during fifteen years residence in the country, by F. Jeppe, F.R.G.S. in 1878. The map was engraved Edward Weller and published by S. W. Silver and Co. Very good. Dissected and mounted on linen. Map exhibits red stains along left fold lines, where map is attached to binder. Folds into original cardboard binder.